Is it just me, or is everyone staring? There is a common cliche in Western films, where the protagonist walks into the saloon through the swing doors and everyone stops what they are doing and silently stares at them. The feeling that the hero of many a Western must have felt is now something that I can acutely relate to. We’ve been spending a couple of days in the mountain town of Ouro Preto. Unlike Petropolis, this is a town which all the guidebooks can’t do enough to recommend, and so we were only too happy to make the 8 hour bus journey from Rio to get here. 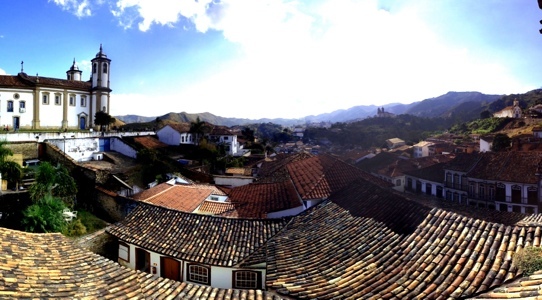 Initially it’s not hard to see why everyone raves about Ouro Preto! It’s everything that Petropolis is not – there isn’t a 1960’s building in site, almost everything seems to date from the 18th Century if earlier and in every direction you look, there is one of the 14 churches that seem to crown the old town, watching over it. However, as we sit on the doorstep of our hostel, waiting for it to open (it’s only 6:30am as the bus was early), we can’t shake off the feeling that everyone is staring at us. There is no denying that we stand out, clearly the only two Gringos in the village, but surely the sight if two backpackers waiting outside a hostel on a town renowned for its tourist charms shouldn’t be that shocking? We get into the hostel and the hostess couldn’t be more friendly, jabbering away to us in Portuguese despite our protestations that we neither speak or understand the language. Later, as we walk around town the feeling of being eyed up continues. But it’s more than that, people genuinely seem to be harbouring a hostile feeling towards us. They can’t possibly know where we’re from, save that we are not the same as them, therefore it seems that this in itself is enough for them distrust and dislike us. These feelings are all compounded as our two days continue. The odd few friendly people we meet are more than offset by people at best apathetic to our presence. Nowhere is this more obvious than when we try to go out for a drink in the evening, walking into bars and restaurants where people are literally staring at us and can make no room for us to sit down. Eventually, we find a deserted bar near the edge if town, where the landlady just seems glad of paying customers, even if they aren’t local! Aside all if this, the architecture and natural beauty of the town and surroundings are noteworthy. The churches are fantastic and the cobbled streets charming. On our second day, it was the feast day of one of the churches’ patron saints and the bells rang out all day… or were they simply ringing to warn the locals that there were foreign devils in their midst!